It’s funny, you’d think going to a casual Halloween party would mean I’d have a relaxed attitude about having to wear a costume. However, that relaxed attitude was really disguised in the form of procrastination and anxiety and perfectionism. I left my outfit until a day before Halloween. I was overthinking all the possibilities, and couldn’t decide on *what* to be, and scared that whatever I picked wouldn’t be good enough. There was no contest, no reason to really care but I did. Me and Nathaniel decided we’d go the easy route, and be Three Hole Punch Jim and Cat Pam. However, I really didn’t want to be a cat. I used the day before Halloween trying to look for a costume to be said Cat Pam, but it did not go according to plan. Probably because I didn’t want to be Cat Pam. This leads us to Halloween. I wake up, and I began the hunt after a long night of Googling. 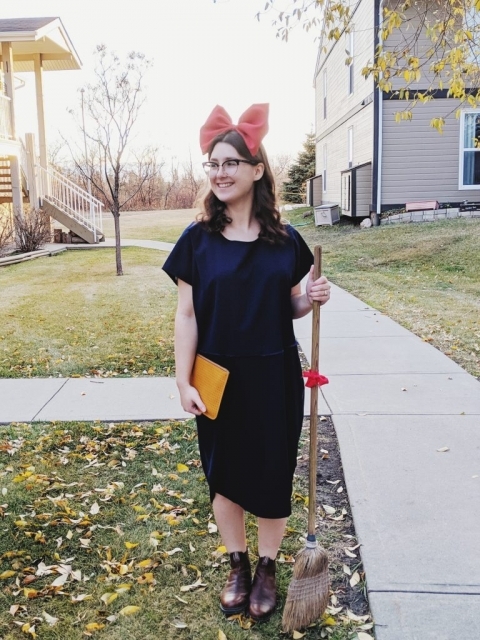 I decided I’d go as Kiki or Baby. Off to Goodwill I went, where I found a perfect top to match Baby from Dirty dancing, however, there were no jean shorts that fit. I searched the aisles, keeping my eye out for a blue dress. I eventually came across a navy blue dress from Workhall. It was as perfect as it was gonna get. I continued looking, but what I found was my only option. Off to the changeroom, hoping it would fit. It did. Now for the bow. I ended up finding red tablecloth fabric for 4.99/meter. I bought half of that, plus some fabric glue. I went home, tested the fabric glue and it didn’t work. Oh yay. I ended up sewing the bow together and it worked splendidly. I wish I made it a bit smaller, but honestly when else is one going to wear a giant bow and not be looked at funny? I didn’t want to spend money or the time finding the perfect purse, plush cat, or red flats. I worked with what I had left at home. A clutch, my Blundstones, and an old broom from my moms. Overall, I’m really happy with my costume and felt great in it. Which in the end, is what’s important. Nathaniel ended up going as Not Jim, Dave. You’d think that would be as simple as buying a red name tag from Staples but they were out of them EVERYWHERE. 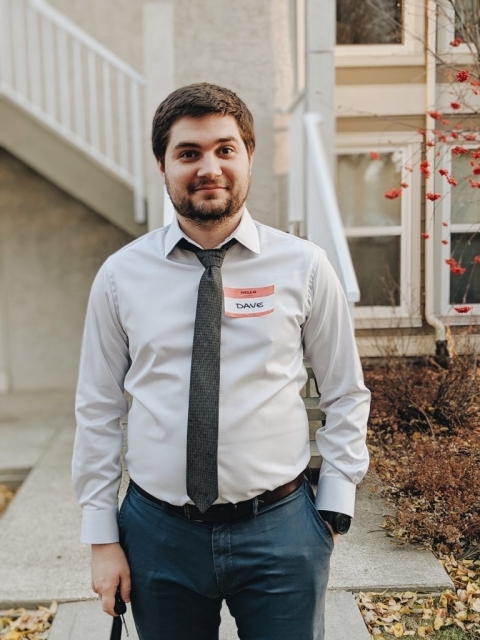 I used my mom’s label printer and coloured in the red to make one…Way too much work for what’s supposed to be a lazy costume. I’ll be laughing about that for a while.